Daiwa Seaborg SB1200MJ Electric Reel Miami Fishing Supply, complete selection of offshore fishing tackle, marine electronics and boat supplies. Feel the Evolution, Feel the Monster. Mind blowing, innovative technology never before experienced. The strong mega monster machine now lives What the Monster is made for? Ultimate Strength!! Mega Torque Motor- The strength of Seaborg’s new custom motor is in the same class as the mighty Marine Power 3000. The power and speed is quiet and smooth, and with an output of approximately 1.3 times greater than previous motors. This is the ultimate battle machine. With all this power, the new aluminium composite housing is designed to maximize the release of heat and keep the motor cool, ensuing that the power is available all the time. This monster has a tough heart inside, to challenge any fierce battle in the sea. 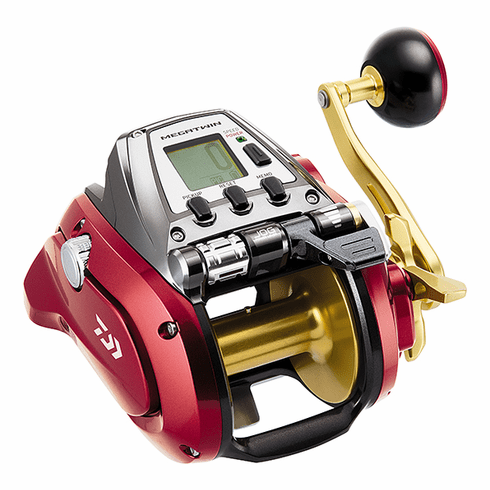 Megatwin- Daiwa’s original Seaborg Megatwin reel design utilizes a two-gear ratio system. The new Seaborg employs a totally redesigned system that allows the user to immediately switch between mega-power mode and mega-speed mode by simply touching a button. During retrieve or when battling a monster the new speed function switches smoothly and effortlessly. With this functionality, an angler can alternate to the best speed, depending on the situation. ATD (Automatic Drag System)- ATD drag system that gives you the power and poise to take control of whatever crosses your angling path. ATD is a combination of seven large carbon washers and improved drag grease. The new grease exhibits a low viscosity at rest, yet becomes more viscous immediately after drag start up. This reduces initial drag start-up inertia. When combined with the structural changes to the ATD Drag washers, results in a smoother stronger drag from the initial hook up, allowing you to concentrate on the fight. This tough drag function will adjust according to the pulling of fish. To keep the drag smooth under extreme pressure , an aluminium drag radiator is located on the handle shaft that dissipates heat away from the drag system, maximizing the release of heat, keeping the drag cooler for better drag performance. This ultimate function will maintain the drag power to help conquer large fish. Also an alarm sound function will notify anglers when line is being pulled out. Jog Power Lever – The new Seaborg Jog Power Lever system is designed for standup fishing techniques. With the standing fight concept in mind, the Jog Lever will allow an immediate response to wind the line. When standing with the rod/reel outfit in your right hand the lever can be controlled with your left thumb. Alternatively when using your left hand to hold the outfit, pinching the lever with your right hand will allow you to control the machine easily. This easy to use function will allow you to continuously lead the fight against your target. Magsealed Ball Bearing – Daiwa’s ultimate technology – Magsealed Ball Bearing prevents water and dust intrusion inside the ball bearing which greatly reduces reel corrosion and noise. Applied to the spool shaft surrounding, a place where invasion of salt and dust is most likely to happen and maintenance is difficult. This will improve the long-term durability and the smoothness. Dot Screen Display- Out in the field it can be tough to read anything on an LCD screen due to sun glare or sunglasses. The Seaborg’s LCD screen displays large letters/numbers and uses a dotted LCD screen to make it easier for anglers to see the display. Line input procedures are selectable in Japanese or English languages. Just let the D-Vec letters on the start screen lead you to exciting world of Dendoh reel fishing. The new 800MJ is designed as the ultimate standup electric game reel, its smaller compact size combined with its immense power allows anglers to place enormous pressure on fish without applying the hurt on the angler. the new motor allows the angler to pump the rod while the motor does all the work, combined with the ATD drag system and just about anything that swims can be subdued in a fraction of time compared to conventional reels and by anglers that simply don’t have the physical strength of others. For ultiomate deep water then the 1200MJ is the ideal choice. Its massive line capacity combined with sheer power is ideal for fishing the deepest waters of the ocean. The new Seaborg reels set a new standard for what is possible with an electric reel. Gone are the days when this type of reel was made just for deep drop fishing. With the new Jog Lever design the Seaborg is the ultimate standup electric game reel. Line Per Handle Turn	24.8"